Not everyone wants to retain the old methods, though. Li Wei, who inherited his family's workshop in Macun in 2008, said: "The traditional papermaking process is too long－it can last months or even years. Fewer and fewer young people are willing to stay in their hometowns and make paper." Production of Jiajiang paper involves 72 steps. "You can work all year round, but end up with little reward," the 33-year-old said. In contrast to Yang, Li introduced machinery in 2010. 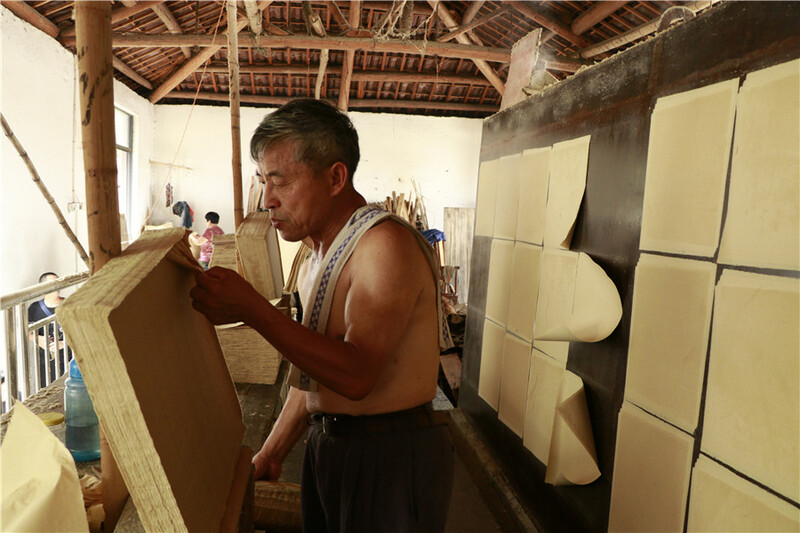 Zhu Zhonghua, whose family has been making paper from bamboo by hand for 13 generations in Datong village, Hangzhou, Zhejiang province, said that although modern production methods can improve the quality of the finished product in many industries, the reverse is true with paper. The traditional method uses lime to process the raw materials because the weak alkali does not harm the fiber, meaning the paper can last hundreds of years. "Modern workshops use strong alkalis and machines to make the pulp, which are harmful to the fiber and greatly reduce the durability of the paper," Zhu said. Since handmade paper is usually more expensive than its machine-made counterpart, few people can afford to use it all the time, especially if they are only practicing calligraphy and painting techniques. "Though paper prices have risen somewhat in recent years, the costs of raw materials and human resources have surged," Zhu said. He noted that the exodus of rural residents to cities has made it harder for traditional manufacturers to find workers with sufficient experience. By contrast, the use of machinery has made it easier for manufacturers such as Li because he not only produces his paper more quickly, but is also able to employ less-experienced workers. Even so, he is still experiencing problems. "There are so many machinery-driven workshops and factories. How can I compete with them, given that costs are high but profits are low?" he said. Zhu, who refuses to use machinery, said, "Handmade paper is known to be of higher quality, so we should always compete by emphasizing quality not price or production capacity."